All-rounder Mohammad Hafeez returned to test cricket after more than two years and scored an impressive century as Pakistan reached 255-3 at stumps on day one of the first test against Australia on Sunday. Hafeez made 126 on a flat wicket and Imam-ul-Haq hit 76 to raise only the 10th double-century opening wicket stand against Australia by any country in test history before the visitors hit back in the last session. “I didn’t play test cricket for over two years, but I always backed myself,” Hafeez said, after hitting 15 fours in his 208-ball 10th test hundred that spanned nearly four-and-a-half hours. 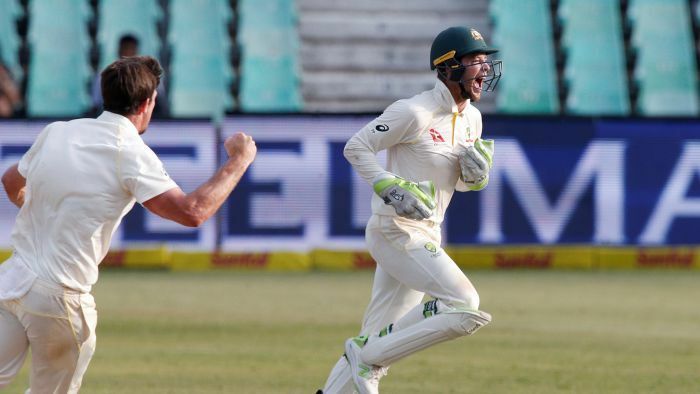 Nathan Lyon finally broke the 205-run partnership when he had Imam caught behind in the second over after tea as the left-hander got a faint edge while going for a hard cut against the off-spinner. Hafeez, dropped on 74 at the long off boundary by Mitchell Marsh, was trapped leg before wicket by Peter Siddle as Australia allowed Pakistan only 56 runs in the last session. Azhar Ali played a rash drive against left-arm spinner Jon Holland and was smartly snapped at mid off by Mitchell Starc as Australia pegged back Pakistan. At stumps, Haris Sohail was 15 not out alongside nightwatchman Mohammad Abbas on 1. Hafeez was drafted late in the Pakistan test squad and grabbed the opportunity on a gentle wicket after captain Sarfraz Ahmed won the toss and elected to bat. Under hot and humid conditions, Australian skipper Tim Paine turned to Lyon as early as the ninth over and used his seamers in short spells. Both Hafeez and Imam had little trouble in negotiating the two seamers — Starc and Siddle — and even Lyon and Holland couldn’t make any impact. Hafeez completed his century off 172 balls with 12 fours as both openers upped the scoring rate in the second session and Pakistan reached 199-0 by tea. But Australia did well in the last 29 overs of the day with seamers getting the reverse swing and the spinners also finding some turn off the wicket. “We didn’t get easy runs and they bowled really well under these conditions,” Hafeez said. Australia named three debutants with batsmen Aaron Finch, Travis Head and Marnus Labuschagne coming into the team for its first test since the ball-tampering incident at Newlands, South Africa in March that saw captain Steve Smith, David Warner and Cameron Bancroft receive lengthy bans for their part in trying to change the condition of the ball with a piece of sandpaper. Hosts Pakistan handed a debut to offspinner Bilal Asif, with 26-test seamer Wahab Riaz selected ahead of rookie Mir Hamza. Australia has lost four of its last five test series in Asia, including a 2-0 series defeat on its last tour of the UAE to play Pakistan in 2014.